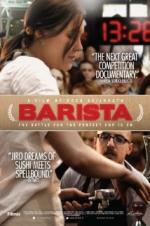 Buy or Rent Barista (2015) Movie DVD & BluRay Online! Movie Plot: Five top baristas find themselves pushing the limits of coffee perfection to win the National Barista Championship – a surreal competition where even one mistake is far too many. Once a year, thousands of baristas square off in competitions around the U.S., but only one will become the National Champion. BARISTA takes viewers on a humorous, emotional and enlightening look into the unimaginable world of coffee competitions and the passionate, lovable and quirky characters who devote their lives to them. If you think you know coffee – this film will make you think twice. These baristas take this universally beloved beverage seriously. Their passion for it can be felt through every frame of the film. BARISTA will take you beyond the drink and shine a light on a unique world very few of us ever knew existed.